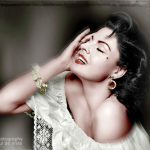 Who could better symbolise glamour than Sue Moreno? This beautiful diva from Holland is endowed with many talents. Trained in the American school, a singer, dancer,model and actress, she is capable of expressing her art in all these fields with equal success. The moment she appears cameras and microphones focalise on her. Sue Moreno is a one of a kind performer. With her strong personality, appearance, high ranging vocal qualities and unique show concepts, she is a bright star who takes you back to the roots of swing, jazz, latin, and the romantic and glamorous forties and fifties, with a modern musical touch. Her voice and looks remind you of some of the best singers and moviestars of the early Hollywood era – when glamour reigned. Sue has been performing on many stages all over Europe, Scandinavia and America. She delivers songs from the heart in various styles and languages (English, French, Spanish, Portuguese). She worked with many international legends and artists. She could be heard in various commercial ads (for example Viktor&Rolf’s perfume Flowerbomb and Otazu jewellery) and has had much coverage on various TV and radio-shows across Europe and America. She also starred as a singer, actress and dancer in various theatre shows. In an already successful career, Sue Moreno has appeared on many stages and in festivals all over Europe and the USA.Considering her varied repertoire, her charisma and her immense presence on stage, she is unique in her category. With her innate sense of swing and her overpowering sensuality,she is at ease with all jazz standards, the syncopated rhythms of rock and rhythm’n’blues, as well as the most evocative ballads and latino memories. Gifted with a sensuous voice in tune with her physique, this fiery brunette is at ease within all spheres of American music. She rarely misses a reminder to her idols,Marilyn Monroe,Peggy Lee,Julie London,Elvis Presley or Etta James etc…which she distills to her audience throughout her amazing show, the “SUE MORENO GLAMOUR SHOW”.